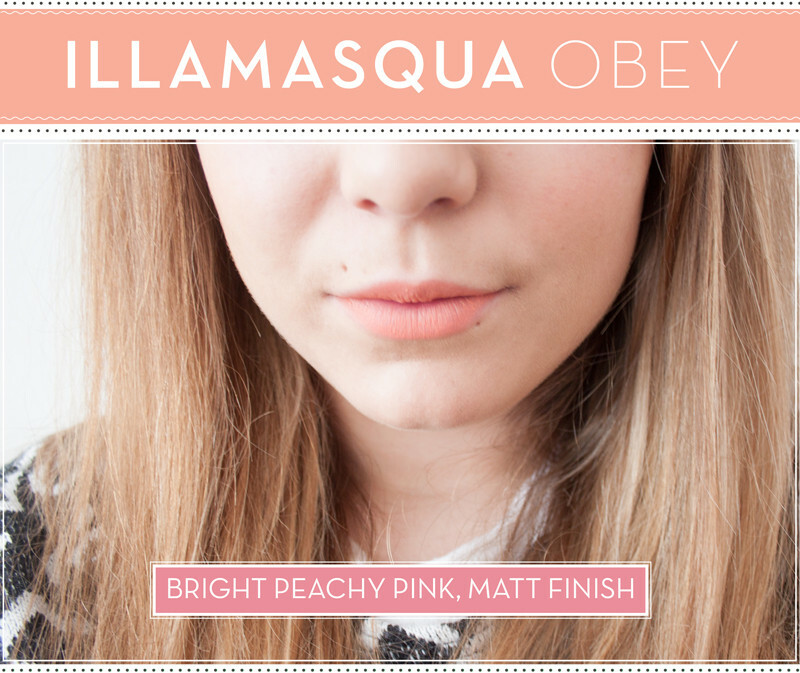 Illamasqua Obey is a bright matte p[eachy pink lipstick. AKA. the best lipstick colour ever. I recently went for breakfast with Illamasqua and they introduced me to some of their colour cosmetics which I wasnt familiar with. I've got plenty of new Illamasqua bits to show off so I'm sure they'll be getting a bit of coverage over the next few weeks. I was instantly drawn to Illamasqua Obey because of the colour and the matte finish. My love affair with peachy-pinks will be going on forever I think! Illamasqua Obey is similar in colour my favourite lip product from them their Androgen pigment. It's slightly more peachy. The texture is very dry and what i'd call a "old fashioned matte". Slightly chalky and a bit drying. I persopnally love that kind of finish but i will say it wont be to everyones taste. Maybe topped with a gloss might make it more wearable. But i have to stress that in general lighter opaque matte shades tend to be on the chalky side. Formula issues aside, the colour is beautiful. 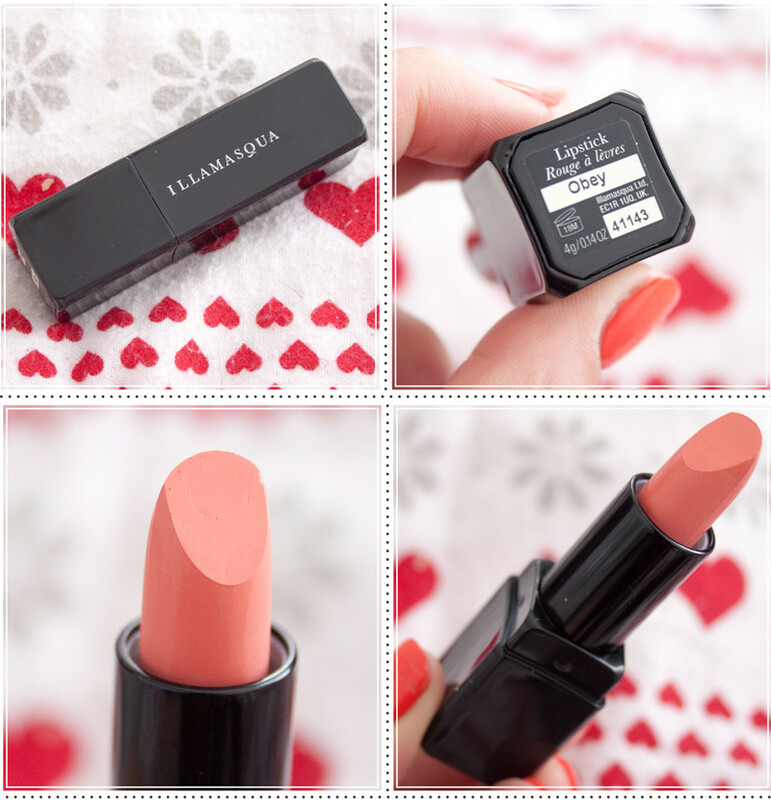 A perfect brightening peach with a white base which makes the lipstick really pop on the lips. It has that really retro 60's look to it which I simply adore. I will say go and swatch this before buying, it might not be for you because of the formula. I can see this being a huge dissapointment for some people so I really will stress that you should test it before investing. It does tug, it is drying and it is very matte. I have been taking good care of my lips recently (post coming soon!) so this doesn't wear too badly on me. But like I said, it's a toughie. Do I recommend it? Hmm, yes and no. I personally like it, but I can see some people saying the exact opposite. Dupes and similar shades include: Illamasqua Androgen Pigment which is similar and the formula is smoother, Barry M 147 is incredibly similar but not quite as drying and Nars Bolero is similar but a little more satin-y in it's finish.